Inspired by nature, Night Owl Paper Goods' real wood photo thank you cards are a beautiful way to share your gratitude with friends and family. 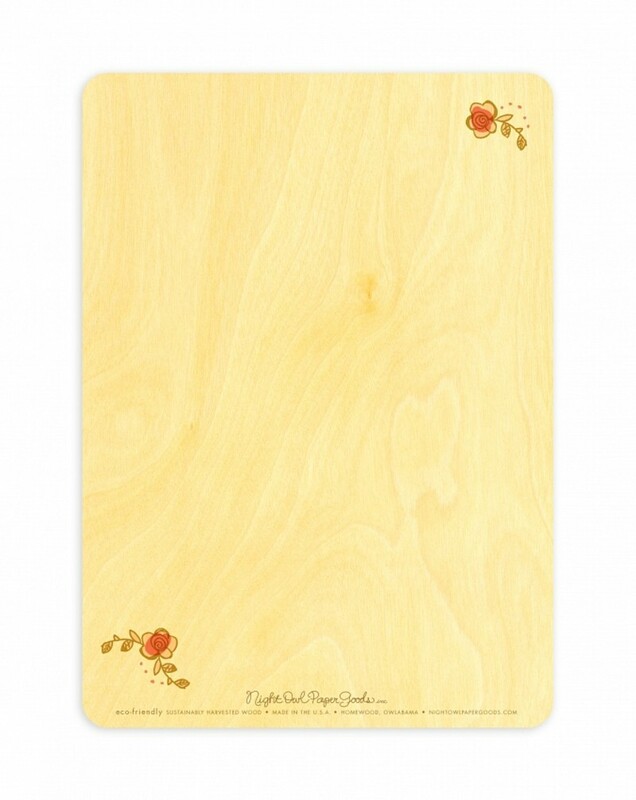 Unlike traditional paper cards, no two wood cards are exactly alike. 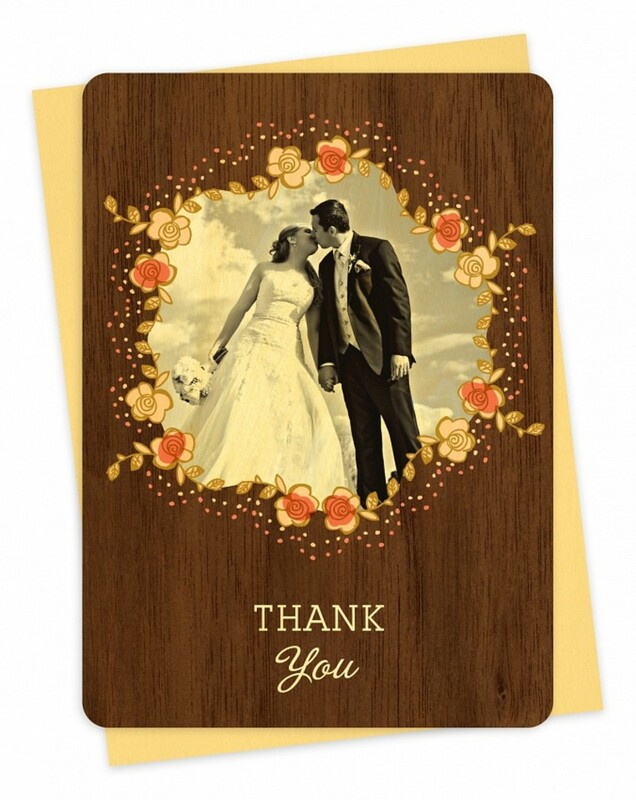 Variations within the wood grain make every card truly one-of-a-kind! Also available in eco-friendly, matte-finish cardstock, printed to look like birch wood — a beautiful and affordable way to express your appreciation. Expedited Shipping Options: Available during checkout. Simply enter your text into the provided text blocks, and you're good to go! If you're eager to order, but require a little more time to work out the exact wording, no worries! Order today and email us your text later! Upload your photo using our easy upload page. We accept Adobe CS5 files, JPEGs or PDFs. Send us BIG photos! 300 dpi will print beautifully! After we receive your order and personalization information, a digital proof will be emailed from one of our designers within 3 business days. Once you approve your proof, we'll quickly queue your order for printing! Orders ship 10-12 business days following digital proof approval. Printed double-sided. Personalized front. Ample room for a hand-written message on back. Submit any photos as 300 dpi JPGs and any artwork as an Adobe CS5 file, PDF or 300 dpi JPG. You can upload your photo(s) or logo using our easy file upload page after placing your order. If you will be submitting a logo, please note that we use a 4-color (CMYK) print process, so we are able to print any and as many colors as you'd like to use in your logo design, with the exception of white. Any white areas in your artwork will simply "knock out," appearing the same color as the card on which your artwork is printed. 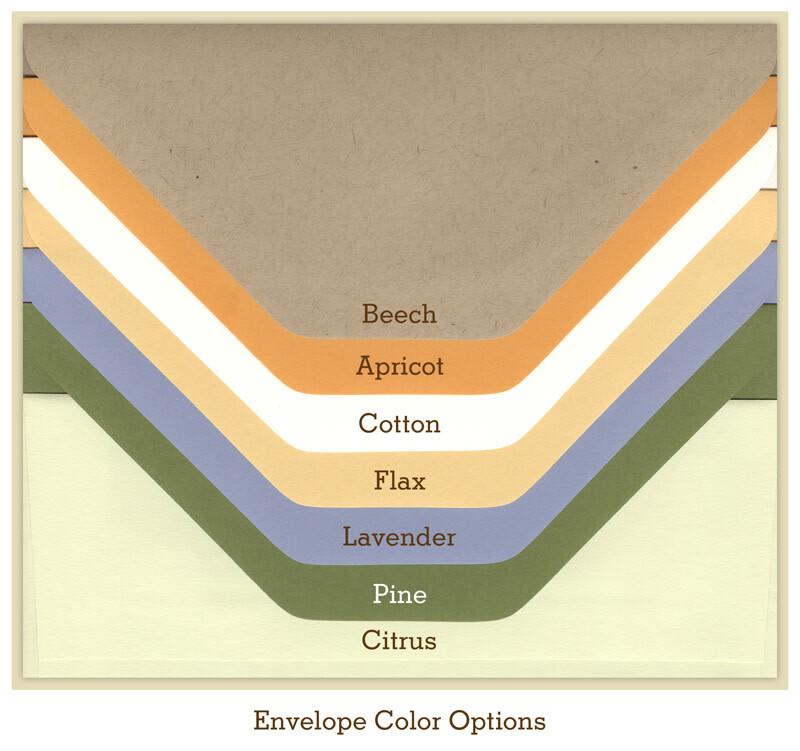 If you select wood as the material for this card, we recommend that you choose hues for your artwork that are similar to those that you see used in the wood cards on our website. This will ensure the colors in your logo will print well on wood. Also note that for wood cards, there will be a degree of transparency in the printing, depending on the ink color. Lighter colors are more transparent and allow the wood to show through, while darker browns, reds and greens print more opaque. Visit our Online Help Center. After we receive your order and personalization information, we'll email you a digital proof within 2 business days. Once we have your approval on the digital proof, your order will ship within 10-12 business days. Please keep in mind that any changes requested during the proof approval process will extend the turnaround time, so be sure to leave a bit of a buffer, just in case! You can view your entire order history and order status by visiting My Account and signing in. You will also receive a shipment confirmation email when your order ships. This email will contain tracking information so that you can track your order via the appropriate shipping carrier. Select a Quantity (minimum 15)15 $6.50 ea. 20 $5.75 ea. 25 $5.20 ea. 30 $4.81 ea. 35 $4.50 ea. 40 $4.33 ea. 45 $4.16 ea. 50 $4.00 ea. 55 $3.98 ea. 60 $3.96 ea. 65 $3.94 ea. 70 $3.92 ea. 75 $3.84 ea. 80 $3.84 ea. 85 $3.84 ea. 90 $3.84 ea. 95 $3.84 ea. 100 $3.65 ea. 105 $3.65 ea. 110 $3.65 ea. 115 $3.65 ea. 120 $3.65 ea. 125 $3.61 ea. 130 $3.61 ea. 135 $3.61 ea. 140 $3.61 ea. 145 $3.61 ea. 150 $3.43 ea. 155 $3.43 ea. 160 $3.43 ea. 165 $3.43 ea. 170 $3.43 ea. 175 $3.30 ea. 180 $3.30 ea. 185 $3.30 ea. 190 $3.30 ea. 195 $3.30 ea. 200 $3.16 ea. 205 $3.16 ea. 210 $3.16 ea. 215 $3.16 ea. 220 $3.16 ea. 225 $3.13 ea. 230 $3.13 ea. 235 $3.13 ea. 240 $3.13 ea. 245 $3.13 ea. 250 $2.99 ea. 255 $2.99 ea. 260 $2.99 ea. 265 $2.99 ea. 270 $2.99 ea. 275 $2.93 ea. 280 $2.93 ea. 285 $2.93 ea. 290 $2.93 ea. 295 $2.93 ea. 300 $2.81 ea. 305 $2.81 ea. 310 $2.81 ea. 315 $2.81 ea. 320 $2.81 ea. 325 $2.79 ea. 330 $2.79 ea. 335 $2.79 ea. 340 $2.79 ea. 345 $2.79 ea. 350 $2.65 ea. 355 $2.65 ea. 360 $2.65 ea. 365 $2.65 ea. 370 $2.65 ea. 375 $2.62 ea. 380 $2.62 ea. 385 $2.62 ea. 390 $2.62 ea. 395 $2.62 ea. 400 $2.52 ea. 405 $2.52 ea. 410 $2.52 ea. 415 $2.52 ea. 420 $2.52 ea. 425 $2.49 ea. 430 $2.49 ea. 435 $2.49 ea. 440 $2.49 ea. 445 $2.49 ea. 450 $2.39 ea. 455 $2.39 ea. 460 $2.39 ea. 465 $2.39 ea. 470 $2.39 ea. 475 $2.37 ea. 480 $2.37 ea. 485 $2.37 ea. 490 $2.37 ea. 495 $2.37 ea. 500 $2.27 ea. Add 5 more and save $0.02 on each! Need more than 750? Contact us for pricing! Your proofs will arrive via email in 1-2 business days!